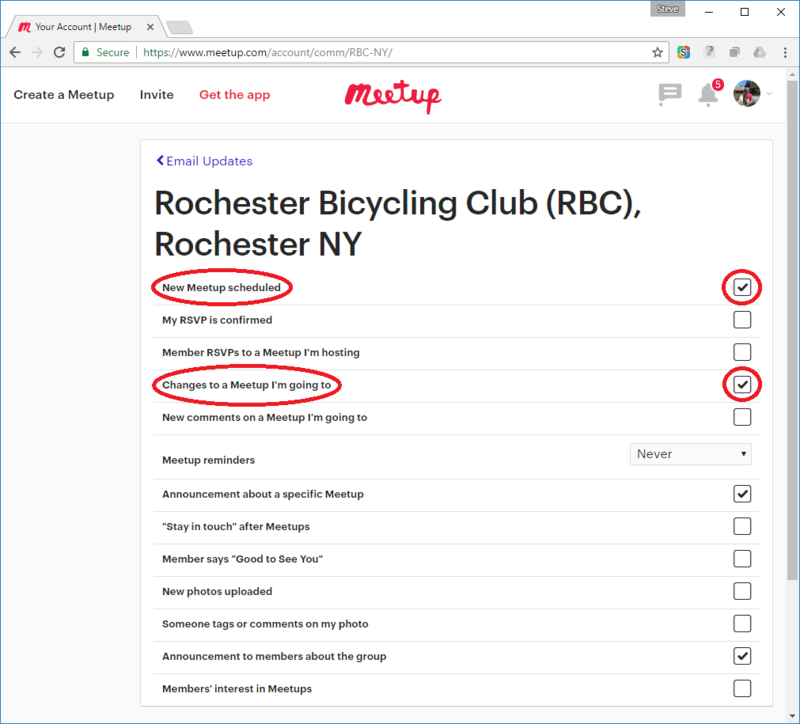 Meetup is a scheduling/calendar website that hosts the RBC ride calendar. While it is not necessary to have a Meetup account to view the calendar, having an account allows you to take advantage of many features. Signing up for a Meetup account is easy and requires minimal personal information. You then "join" the RBC Meetup group. The most important aspect of RBC Meetup is the ability to communicate about rides *before* they happen. People can post about route changes/detours, neat/seasonal stops, groups riding different distances, tailgates/picnics, swims, etc. This can really enhance the experience for everyone. Rides added during the season will only appear on Meetup. If you are an RBC Meetup member you can get email notifications about these added rides. Members can RSVP for rides they will be attending, which helps to show the kinds of riders who plan to come. Folks you've enjoyed riding with before are often great motivation for getting out yourself! Also, by RSVPing you will be notified of any important information related to the ride. The alternative is to check Meetup for changes ... particularly important when the weather is "iffy". Besides, it's fun to stop by Meetup now and then just to see pictures and comments from recent rides! Meetup is also available as a phone app. Download and enjoy the features while on the go. If you are new to Meetup, you are probably seeing too many emails! Most of us immediately adjust Meetup Email settings to eliminate all but a few notifications. We tend to use Meetup more like a "bulletin board", looking at it now and then to see what's coming up and any last-minute changes, especially a few hours (or night) before rides we might attend. The following screenshots show email settings that work best for most folks. 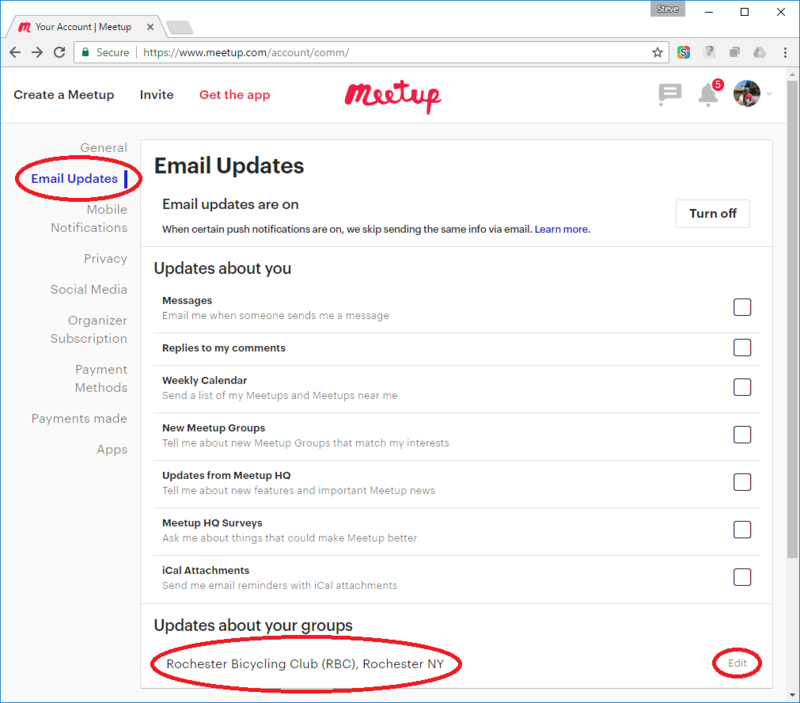 Notice that Meetup has general email settings ("Updates about you"), as well as specific settings for each group ("Updates about your groups"). Many of us are members of several Meetup groups (RBC, GVHC, Huggers, etc. ), and we may have different settings for each. ​"New Meetup scheduled" sends emails about new rides (ex: weekday rides). "Changes to a Meetup I'm going to" sends email updates on rides you've RSVP'd "Yes". You *must* RSVP "Yes" to get these. Otherwise, make sure to periodically look at the comments of specific events you are interested in. The remaining two updates checked are for "Announcements" made by the group administrators. We might have something useful to say someday :-), so we recommend leaving these checked. Check/uncheck choices until you have what you want. We also recommend setting "reminders" to "Never". Finally, did you see the "kill switch" for all email updates ("Turn off" button at top of second screenshot)? Be aware that if you turn off *all* email updates, you won't get any of the ones you've checked. Some folks do this because they prefer getting notifications directly on their phones & tablets. Further configuration settings are available in the Meetup app on those devices.